Arrival Day! We will pick you up at the airport and make you feel really welcome and take you to Fátima’s Backpackers to prepare yourself and get practical information. The opening of the exchange will start at 18h were you will meet and greet your family for the coming week in an evening of social dance and performances, it’s the Hoyo Hoyo Welcome Party! Dinner will be provided at the venue. In the morning we will have two dance workshops at a venue with walking distance from Fátimas. The first one is “Introduction to African and Mozambican Rhythms” and the second “The Afro Swing Connection”. After the classes we will have lunch at own cost, very affordable local food available close by. Afternoon – Visit to Polana Caniço – Hodi’s neighbourhoods! A minibus will pick you up at Fátima’s and take you to the suburb where most of Hodi dancer’s have grown up and still live. We will take you for a tour to the local market, listen to stories about local traditions and invite you to the brothers Manhiça’s house for the Ndzumba ka Manhiça – The Manhiça House Party. 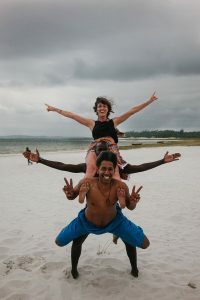 Elias, Manuel, and Augusto will open their home for us to have a traditional Mozambican dinner with plenty of time to get to know each other, play games, sing and dance until late evening. This day will truly make you land in Mozambique and the friendliness and open hearts of the Hodi family. In the morning we will depart to Ponta D’Ouro! 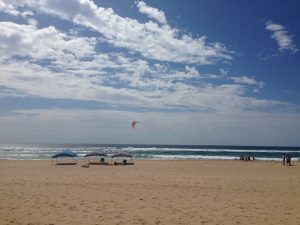 The minibus will pick us up at Fátima’s to take us to the beautiful beach Ponta D’Ouro, around 3h bus ride from Maputo. Upon arrival we will get installed and cook our first communal meal for lunch. 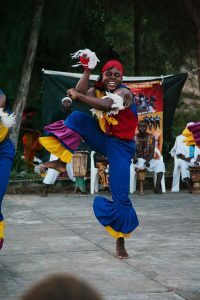 In the evening before dinner we will have a workshop in Traditional Mozambican dance. After dinner we will go to Lirhandzo Swing Out Party at Love Café! Love Café in Ponta D’ouro invites you to a magical, cozy environment to connect with each other with our hearts. The evening will start with a Taster Class in Blues and after that the swing Dj music will take us away for a night of casual lindy hop, jazz and blues social dancing. Dance barefoot, in your swim suit or whatever makes you feel comfortable! 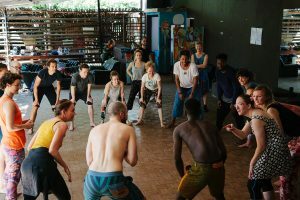 In the morning we will have breakfast followed by an 1,5h long dance workshop in Traditional Mozambican circle dances. This day there will free time for relaxing or going for individual adventures like snorkeling or wale watching that Ponta D’ouro offers at your own cost. More info to come. 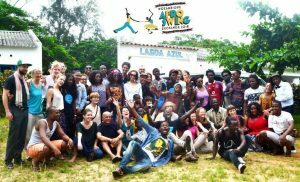 17h – Kuzangalala Afro Swing Show with Hodi Maputo Afro Swing! Kuzangalala means life and joy in Changana. This show will take you on an energetic journey from Mozambique to Harlem, a dance performance you will late forget! After the show we will relax and have dinner. Xitiko Ni Mbaula- Afro Beach Party. Xitiko Ni Mbaula is the wooden triangle that brings the fire to life. This is our African party that will take you to the roots of Mozambican tradition. Open fire at the beach, singing, drums and circle dances until late ours. The evening will start with Mozambican drumming and singing workshop with Augusto and Elias Manhiça. In this workshop the Manhiça twins will give you another piece in the rhythm jig saw pussle: they will teach you how to play different traditional instruments, explore polyrhythms and singing. In the morning we will have four 30 min dance workshops with three different teachers! Four 30 min dance workshops! Get a taste of different African styles, traditional and urban to prepare yourself for the Kuphatima ka Nweti – The Moonlight Dance! In two hours you will get a taste of Marrabenta, Soukouss/Kwassa Kwassa, Pantsula and Afro House. After lunch we will have an afternoon adventure! We will spend the day away all together, this is a time where you are invited to bring your local games/songs/traditions. We will return to prepare dinner. Destination to be announced! In the evening we will have dinner followed by Kuphatima ka Nweti – The Moonlight Dance! Let’s put on our swing attires and show Ponta D’ouro how to swing out and jazz it up! The night will play a mix of Swing music plus traditional and urban African music. Show the moves from your morning Urban Dance classes and maybe the locals will show us some moves in return! During the evening there will be one taster class in Kizomba! Breakfast followed by departure to Maputo. Arrival at Fátima’s in the afternoon and free time for dinner at own cost in Maputo. In the evening we are heading to the Concerto Sizodivana! 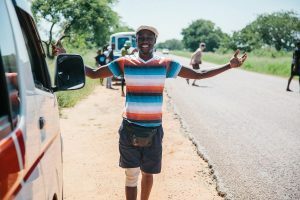 Sizodivana means to reencounter in Changana, we are reencountering Maputo, friends who didn’t come along to Ponta D’Ouro and the local population in Maputo. This evening is an open city event and will start with a taster class in Lindy hop open for the public followed by social dance and live African traditional and Jazz/Swing music until late hours. Free time in the morning and over lucnh for resting or going to the local FEIMA Art Craft Market close to Fátimas. Pick up in the afternoon for last day’s adventures and good bye party. This day the Hodi Swing Kids will be in focus! 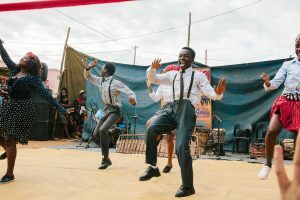 Invited teachers will be able to give swing classes to the kids that we all can join followed by a dance performance with the amazing dancers from our Youth Program and the second edition of our Mozambican Swing Championships. In the night you are welcome to our goodbye party Salani Vamakweso – Fairwell Brothers and Sisters! The night will be dedicated to having time to enjoy our new friendships over Mozambican food, music and dancing to say goodbye and thank each other for the experience. This is your earliest departure day! An option is stay in Maputo a few days or go to Kruger Park Tuesday March 19 – 20. WOW! What Workshops will I get?